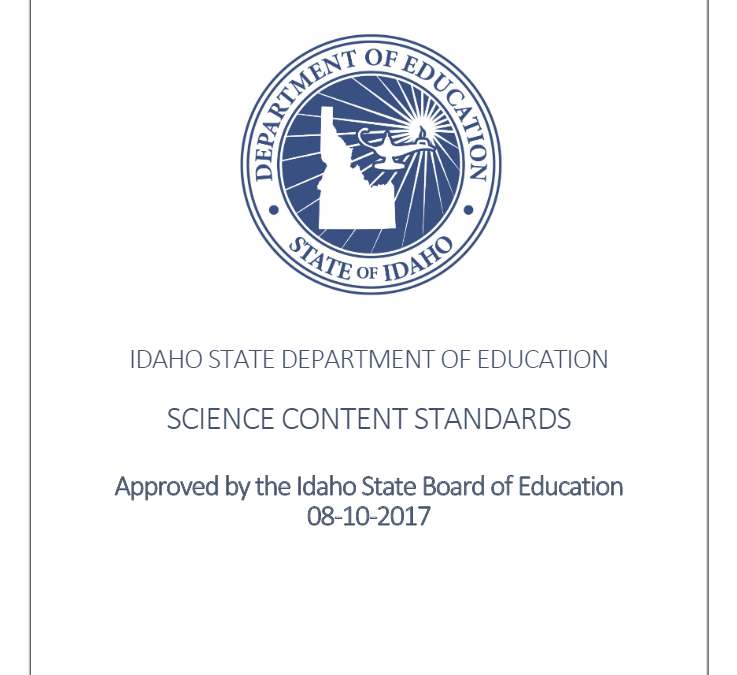 In the discussion over new science standards for Idaho schools, accuracy and the full set of facts have been an unfortunate casualty. We’ve written before about some (not all) misleading coverage of the state House Education Committee’s vote on the standards, which would apply to public school students from kindergarten through high school. Many reports left the impression that Republicans had “gutted” the standards, completely or almost completely removing any mention of climate change or the effects of human activity on the environment. That, of course, is completely wrong. Out of 327 science standards, the House Education Committee removed only one, for fourth grade, and that one did not mention climate change. The other 326 remained, and of those we counted 19 total that mention climate change, rising global temperatures, the effects of human activity on the environment and/or possibilities for mitigating those effects. That list is at the bottom of this post, as is the text of the one standard that was removed. Most recently, PBS Newshour ran a national piece that took the term misleading to a whole new level. The reporter failed to mention all the standards that remain. By omitting such crucial information, we believe the PBS report should be clarified at a minimum. We have contacted the Newshour and are awaiting a decision. The House Education Committee also removed “supporting content” from the proposed standards because some members were concerned about including curriculum guidance in law, preferring that responsibility be left to the districts. State Superintendent of Public Instruction Sherri Ybarra told the committee her office would make the supporting content available to school districts; it is also available to the public online here. In the meantime, let’s stick to the facts. Students, teachers, parents and the general public deserve to know what is actually happening. It is especially important in a discussion about science that we have the full truth. 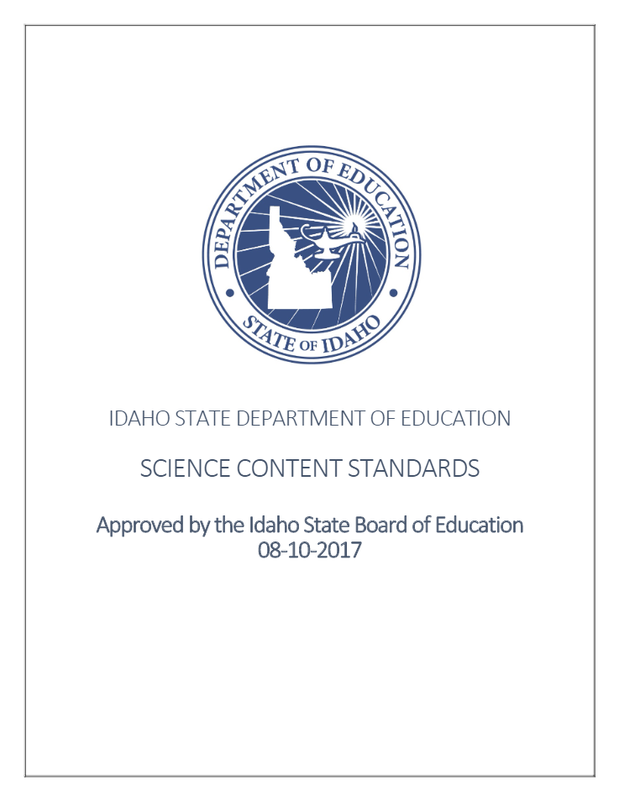 The state Senate Education Committee is scheduled to vote on the science standards at its hearing this afternoon (Feb. 22) at 3 p.m. We’ll keep you updated. ESS2-K-3. Communicate solutions that will reduce the impact of humans on the land, water, air, and/or other living things in the local environment. ● Further Explanation: Examples of human impact on the land could include cutting trees to produce paper and using resources to produce bottles. Examples of solutions could include reusing paper and recycling cans and bottles. ESS3-5-1. Support Obtain and combine information about ways individual communities use science ideas to protect the Earth’s resources and environment. LS2-MS-6. Evaluate competing design solutions for maintaining biodiversity and ecosystem services. ● Further Explanation: Examples of ecosystem services could include water purification, nutrient recycling, and prevention of soil erosion. Examples of design solution constraints could include scientific, economic, and social considerations. ESS3-MS-1. Construct a scientific explanation based on evidence for how the uneven distributions of Earth’s mineral, energy, and groundwater resources are the result of past and current geoscience processes. ● Further Explanation: Emphasis is on how these resources are limited and typically non-renewable, and how their distributions are changing as a result of removal by humans. Examples of uneven distributions of resources as a result of past processes include but are not limited to petroleum (locations of the burial of organic marine sediments and subsequent geologic traps), metal ores (locations of past volcanic and hydrothermal activity associated with subduction zones), and soil (locations of active weathering and/or deposition of rock). ESS3-MS-3. Apply scientific principles to design a method for monitoring and minimizing a human impact on the environment. ● Further Explanation: Examples of the design process include examining human environmental impacts, assessing the kinds of solutions that are feasible, and designing and evaluating solutions that could reduce that impact. Examples of human impacts can include water usage (such as the withdrawal of water from streams and aquifers or the construction of dams and levees), land usage (such as urban development, agriculture, or the removal of wetlands), and pollution (such as of the air, water, or land). ESS3-MS-4. Construct an argument supported by evidence for how increases in human population and per-capita consumption of natural resources impact Earth’s systems. ● Further Explanation: Examples of evidence include grade-appropriate databases on human populations and the rates of consumption of food and natural resources (such as freshwater, mineral, and energy). Examples of impacts can include changes to the appearance, composition, and structure of Earth’s systems as well as the rates at which they change. The consequences of increases in human populations and consumption of natural resources are described by science, but science does not make the decisions for the actions society takes. ● Further Explanation: Examples of factors include human activities (such as fossil fuel combustion and changes in land use) and natural processes (such as changes in incoming solar radiation and volcanic activity). Examples of evidence can include tables, graphs, and maps of global and regional temperatures, atmospheric levels of gases such as carbon dioxide and methane, and natural resource use. LS2-HS-7. Design, evaluate, and refine a solution for reducing the impacts of human activities on the environment and biodiversity. ● Further Explanation: Examples of human activities can include urbanization, building dams, and dissemination of invasive species, utilization of non-renewable resources as opposed to renewable resource. ● Further Explanation: Emphasis is on using data to provide evidence for how specific biotic and abiotic differences in ecosystems (such as ranges of seasonal temperature, long-term climate change, acidity, light, geographic barriers, or evolution of other organisms) contribute to a change in gene frequency over time, leading to adaptation of populations. LS4-HS-5. Evaluate the evidence supporting claims that changes in environmental conditions may result in: (1) increases in the number of individuals of some species, (2) the emergence of new species over time, and (3) the extinction of other species. ● Further Explanation: Emphasis is on determining cause and effect relationships for how changes to the environment such as deforestation, over fishing, application of fertilizers and pesticides, drought, flood, and the rate of change of the environment affect distribution or disappearance of traits in species. LS4-HS-6. Create or revise a simulation to test a solution to mitigate adverse impacts of human activity on biodiversity. ● Further Explanation: Emphasis is on designing solutions for a proposed problem related to threatened or endangered species, or to genetic variation of organisms for multiple species. ● Further Explanation: Examples should include climate feedbacks, such as how an increase in greenhouse gases causes a rise in global temperatures that melts glacial ice, which reduces the amount of sunlight reflected from Earth’s surface, increasing surface temperatures and further reducing the amount of ice. Examples could also be taken from other system interactions, such as how the loss of ground vegetation causes an increase in water runoff and soil erosion; how dammed rivers increase groundwater recharge, decrease sediment transport, and increase coastal erosion; or how the loss of wetlands causes a decrease in local humidity that further reduces the wetland extent. ● Content Limit: Assessment of the results of changes in climate is limited to changes in surface temperatures, precipitation patterns, glacial ice volumes, sea levels, and biosphere distribution. ● Further Explanation: Examples of key natural resources include access to fresh water (such as rivers, lakes, and groundwater), regions of fertile soils such as river deltas, and high concentrations of minerals and fossil fuels. Examples of natural hazards can be from interior processes (such as volcanic eruptions and earthquakes), surface processes (such as tsunamis, mass wasting and soil erosion), and severe weather (such as hurricanes, floods, and droughts). Examples of the results of changes in climate that can affect populations or drive mass migrations include changes to sea level, regional patterns of temperature and precipitation, and the types of crops and livestock that can be raised. ESS3-HS-2. Evaluate competing design solutions for developing, managing, and utilizing energy and mineral resources based on cost-benefit ratios. ● Further Explanation: Emphasis is on the conservation, recycling, and reuse of resources (such as minerals and metals) where possible, and on minimizing impacts where it is not. Examples include developing best practices for agricultural soil use, mining (for coal, tar sands, and oil shales), and pumping (for petroleum and natural gas). Science knowledge indicates what can happen in natural systems—not what should happen. ESS3-HS-3. Create a computational simulation to illustrate the relationships among management of natural resources, the sustainability of human populations, and biodiversity. ● Further Explanation: Examples of factors that affect the management of natural resources include costs of resource extraction and waste management, per-capita consumption, and the development of new technologies. Examples of factors that affect human sustainability include agricultural efficiency, levels of conservation, and urban planning. ● Content Limit: Assessment for computational simulations is limited to using provided multi-parameter programs or constructing simplified spreadsheet calculations. ESS3-HS-4. Evaluate or refine a technological solution that reduces impacts of human activities on natural systems. • Further Explanation: Examples of data on the impacts of human activities could include the quantities and types of pollutants released, changes to biomass and species diversity , or areal changes in land surface use (such as for urban development, agriculture and livestock, or surface mining). Examples for limiting future impacts could range from local efforts (such as reducing, reusing, and recycling resources) to large-scale geoengineering design solutions (such as altering global temperatures by making large changes to the atmosphere or ocean). • Further Explanation: Examples of evidence, for both data and climate model outputs, are for climate changes (such as precipitation and temperature) and their associated impacts (such as on sea level, glacial ice volumes, or atmosphere and ocean composition). • Content Limit: Assessment is limited to one example of a climate change and its associated impacts. ESS3-HS-6. Use a computational representation to illustrate the relationships among Earth systems and how those relationships are being modified due to human activity. • Further Explanation: Examples of Earth systems to be considered are the hydrosphere, atmosphere, cryosphere, geosphere, and/or biosphere . A n example of the far reaching impacts from a human activity is how an increase in atmospheric carbon dioxide results in an increase in photosynthetic biomass on land and an increase in ocean acidification, with resulting impacts on sea organism health and marine populations. ● Content Limit: Assessment does not include running computational representations but is limited to using the published results of scientific computational models. ● Further Explanation: Examples of renewable energy resources could include wind energy, water behind dams, and sunlight; non-renewable energy resources are fossil fuels and atomic energy. Examples of environmental effects could include negative biological impacts of wind turbines, erosion due to deforestation, loss of habitat due to dams, loss of habitat due to surface mining, and air pollution from burning of fossil fuels. Last Chance for Oliver North General Admission Tickets – Dinner Tickets Sold Out!